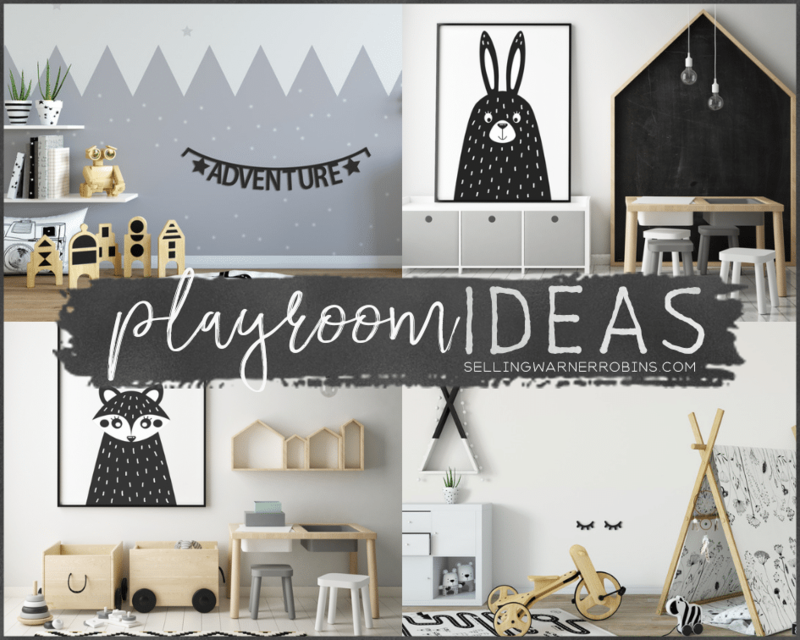 If you are fortunate to have a spare room or adequate free space in your home, you can easily create the perfect playroom that both you and your kids will love. For starters, it can keep toys and games from getting scattered all over the house! It can also be an area where you know the kids will stay occupied while you take on other tasks such as exercise, work, or even while you enjoy downtime. The fun thing is, the room can be transformed into whatever your imagination can dream up, so enjoy the process. Remember to take into account the personality and age of your kids when you put the playroom together. You want it to be a safe place but also one where your children will have fun, utilize their creative energy, and want to stay and play in (otherwise they will end up dragging their stuff throughout the living room and other parts of the house). You also want the playroom to be durable so use materials that are easy to maintain and clean. Who determines what “perfect” is? You do so take that blank canvas and go as big or little as your passion, available space, and budget takes you. 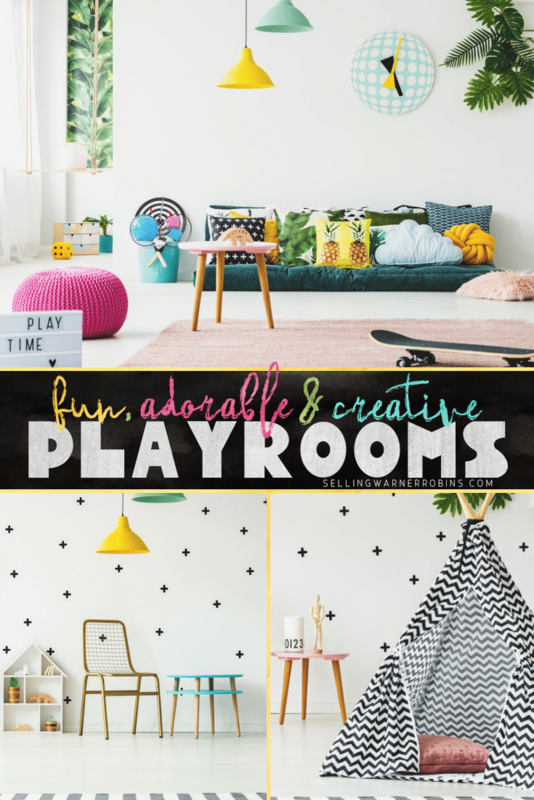 Here are several tips even a novice can take on to create the perfect playroom your kids can enjoy for years to come. It all starts with the walls. What you do with or put on them sets the tone for the rest of the space. That is why it is smart to ensure you have a plan of attack (or at least a rough idea what you envision them looking like). Being prepared will save you time and money and eliminate do-overs! Should you paint? Do you add flare to the space? Does it make sense to try something totally unique? You decide! Chalkboard paint – Unsupervised young kids with pens, markers, or crayons are typically a recipe for disaster. They are drawn to walls (no pun intended) so why not give them a space to actually do their thing! Take the extra step and add a border to highlight where their scribbles and artistic talent should be displayed. 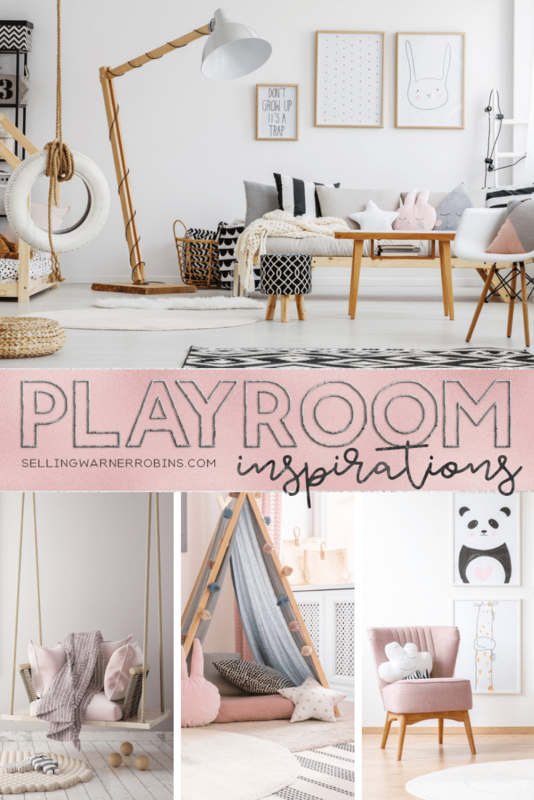 Open up the palette – A playroom is the perfect opportunity to use hues you might not be willing to try anywhere else in the house. Bold colors, patterns, theme related styles, a mural, as well as unique shapes (ie. dots, stars, goldfish, etc.) and designs (i.e. beach balls, clouds, a house, etc.) all get the thumbs up. Decals/stick-ons – There are so many choices available it can be a bit overwhelming to pick a favorite. For instance, if you are going after a nautical theme, it could make sense to strategically place anchors, boats, waves, or even fish on the walls. Similarly, if going after a princess look, you could place fancy shoes, tiara’s, or even a castle on an accent wall. If your kids are animal fans, having exotic animals staring back may be the look you are after. You get the idea…there are options for just about any look you can imagine. 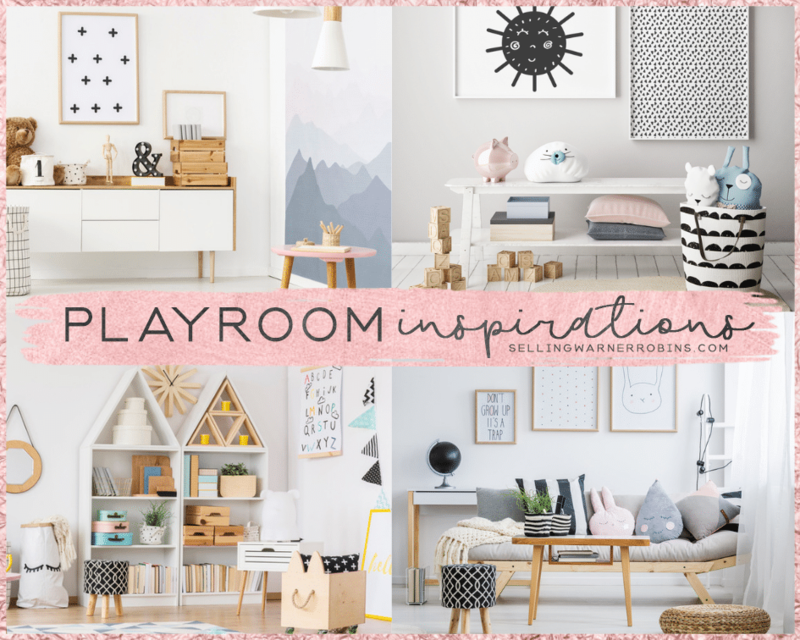 With a little imagination, you have the ability to turn an ordinary room into an extraordinary playroom you will be proud of and your kids will have years of fun using. With young kids roaming around, going with carpet is a good idea assuming they are not allowed to eat or drink in the playroom. If they are, going with something that is easier to clean (like tile or luxury vinyl plank) might be the smart move. For older kids, let them help out by choosing something they like. Whatever type of flooring you choose, there are a multitude of options available. A checkerboard design, a wild hue, a rainbow palette, or even a custom design are all available depending on your budget and whether you can do the installation yourself (to save money) or will need to hire someone to do the work. This is the one area in the playroom where being practical definitely makes the most sense. There are so many options and styles it can become a bit overwhelming to choose just one. So don’t. Go with as many selections as makes sense for the space. For instance, using bean bags gives the room a laid back feel and kids of all ages love them. You can also hang wicker chairs from the ceiling or go completely bonkers and put in a swing (safety first of course). Another option that makes a lot of sense, in lieu of using conventional couches and chairs, is to place pillows or cushions directly on the floor. You can mix and match colors/styles and give the room a funky look and feel that your children will absolutely love. If you want to go more conservative and functional, an oversized chair or a colorful loveseat can really set a room off. Unless the space will be used for entertaining, there is probably not a need to overdo things with the amount of furniture you choose for the playroom. If there is not a creative space for your kids to do their thing, you can bet they will find somewhere else to build, draw, read, etc.. Utilizing a table is a smart choice and will help keep messes contained. It will also help keep them engaged with the activity at hand, especially younger children who have a short attention span. How functional or stylish you decide to go depends on the age of your kids and the activities they will be undertaking. Another excellent option is to create a nook or window seat where they can play with toys, snuggle, or read a good book. Studies have shown when people have a space they can call their own, they are more apt to spend quality time using it. Other options include an area where they can play house, a stage for singing or walking the runway, a kids kitchen or construction space, or just a hangout area where they can feel independent and have some downtime. You can DIY it (either with a kit or freehand) or spend a little money and have a handyman build an area. Ideally, the space is inviting and warm, becoming an oasis where your kids can use their creativity and imagination. Having some sort of storing system is a must! Using built-ins, if the room has them, is an excellent way to keep the entire room neat/tidy and organized. It also provides an opportunity to display artwork your kids may have created, show off some of their toys/collectibles, or even accentuate the theme you have incorporated into the space. Other options include using store bought units, door hangars, or even homemade shelves to keep clutter to a minimum. If you have incorporated a window seat into the playroom, the compartment can easily be used to keep puzzles, games, blankets, or whatever else you want out of sight when not in use. The key to successful storage is versatility so do not be afraid to have dual purposes for items (i.e. an ottoman with a lid/top can store videos or games, and a table can have pull-out drawers or space for decorative baskets). I have never met a kid that did not like to have a secret space/place to hide or keep their “valuables” away from prying eyes. Adding hidden drawers, using toys or furniture to create an empty compartment, or having a crawl in or under space will definitely be appreciated by your children. If there is room for a hideaway, that is something well worth considering. It can be quite functional, doubling as a naptime spot or one where they can go and relax. An added benefit is it will keep them from trying to build blanket or box forts in your living room and getting under foot. A few other simple and popular options that you can easily make or buy a kit for include a tepee, a wooden or fabric induced cubby, or even a get away space inside a cupboard or wardrobe. If you are really handy, a loft hideaway or a trap door into a space under a raised floor are options worth exploring. TV/electronics hub – Essential for some and optional for others but worth consideration whatever your reasons are for setting up the playroom. To keep children occupied, setup a gaming center, a music station, or a place where they can watch parent approved tv or videos. A climbing wall – Safety first but imagine the possibilities. I want one myself! 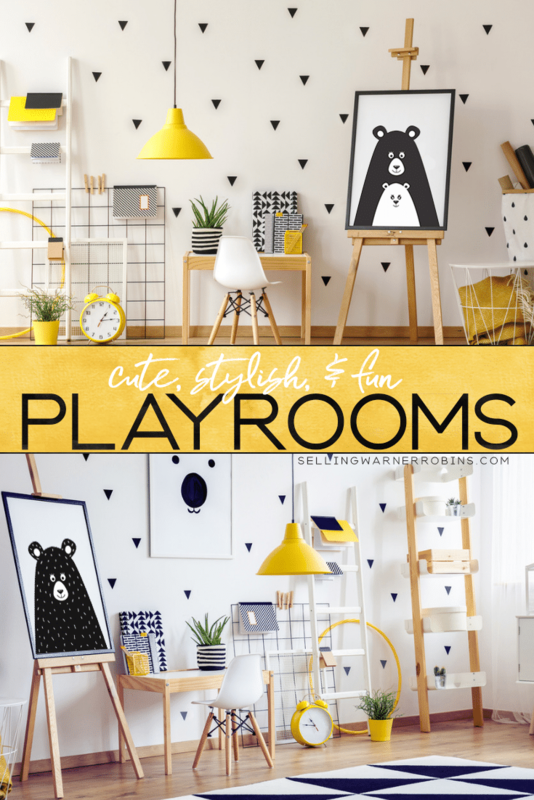 Artwork station – Whether it is a wall, a dedicated bulletin board, or perhaps a floating display that hangs from the ceiling, having their masterpieces prominently displayed will build memories and make the playroom warm and personal. Kids gym – Complete with choices to increase hand/eye coordination, improve balance, and allow them to burn off some of that boundless energy they seem to have. Activity zones – If space permits, creating zones for specific activities or events may be something you want to pursue. This works well if your kids have specific hobbies or you want to limit certain activities (like painting or playing with Lego)to a defined location. Off-the-wall – Perhaps a slide, race car they can “drive”, or even a make believe zoo are choices that could make sense in the right setting. Clearly, there is practically no limitation to what can be dreamed up to make your playroom unique, functional, and fun. What are a few of the things you would want to add to yours? The tendency is to go full throttle with a particular theme or style, which can be a lot of fun. However, keep in mind that as the kids grow, and their likes and dislikes change, you may need to make changes to the playroom to keep them interested in using it. 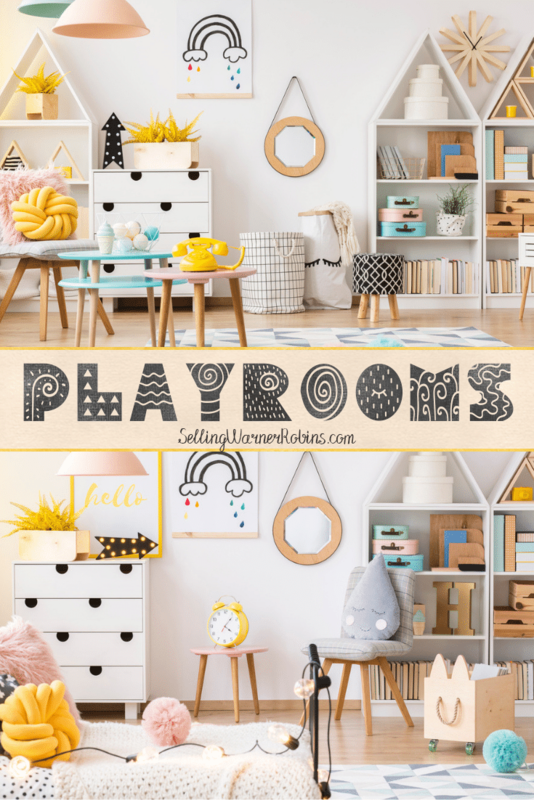 If keeping your kids occupied in one place, ensuring their clutter stays confined to one room, helping you minimize putting their things away (or fighting with them to take care of it), all sound good, then creating a playroom is something you should consider.